Kona winds....go dive! That was the agenda for today. Get fish for the New Year's party. Got to the harbor at 7:00 am and the parking lot was full. Boats were making a dash for the buoys and the first thing we see is this awesome double rainbow that was picture perfect! The Hanapa'a boys were out on a troll and Reid was anxious to get out as soon as possible. We spent our time for pelagics but to no avail so reef action it was...Kirby got a nice Omilu and we got enough fish for the rest of the week. Kirby's protege, Maki even speared her first fish! Look out Kimi Werner, you may have a new dive partner calling you soon. We were so hungry after diving we fillet one of our fish right on the sidewalk, took out some wasabi and shoyu and it was sashimi time. Surf coming up tomorrow on the north so wax up and go surf! Another perfect day in paradise! I woke up early today with no alarm clock and decided to go for a quick surf to get the day started. 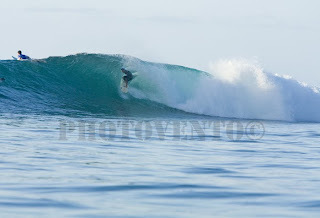 I haven't got to surf pipe recently so took out my bigger board and was the 10th guy in the line up. My eastside buds Wade Tokoro, Jon Taba, and Rick Shimabukuro was out and it felt like old times again. Jon would always be pushing me to charge when the lip was throwing over and I had to go or wouldn't hear the end of it. Mike Stewart was out and 25 other guys but everyone was taking turns and was cool to get a few good ones. Now I remember how good this wave is and how heavy as well. Backdoor was also working so it helped with the crowd factor. Guys were getting pitted and spitted out the barrel both ways. Buoys coming down for a day but back up tomorrow night. I need fish for New Year's Party so gotta go dive! Today Northshore is up! I drove up around the eastside and it wasn't happening so I was forced to make the drive to the country. After checking all the spots I was tired of driving so I fueled up on a Ted's bakery pastry and paddled out Sunset Beach. Luckily I had my quiver in the van so I could go out. Saw the heavy weights out along with Randy Rarrick, Dennis Pang, and Waimea boys. Took a spin past the Pipeline and it was going off too in the 6-8 ft. range with spitting barrels. This week should be full of surf, sun, and sea breezes so catch it early if you can. I tried my luck with a frozen uhu and pulled out Kimi Werners Ti-leaf steamed uhu recipe but the uhu was too big so I baked it. 45 minutes in the oven was perfect for this bad boy. There was so many grinds enough to last through the new year! After lunch I had to make sure my new wetsuit would still fit. Thank goodness I bought the larger size with room to expand and strech for holiday feasts like this. We ended the day with a afternoon surf at one of my secret spots where I could burn off those calories for the next New Years party. Kona winds are here! You know what that means? 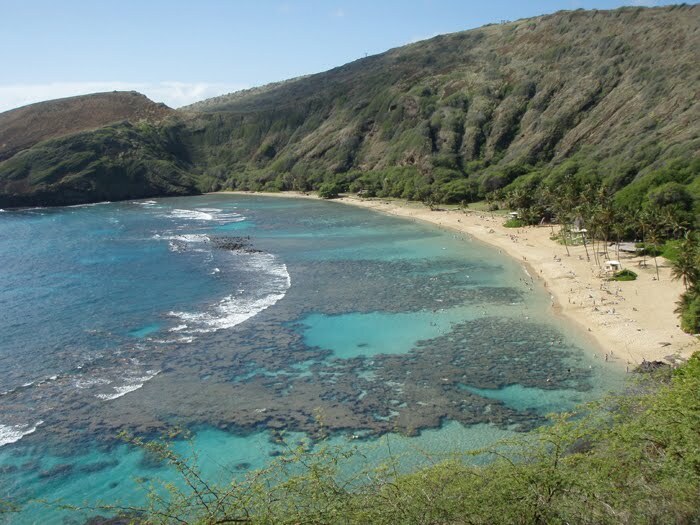 This morning I started my Christmas shopping and heading straight for one of my favorite dive shops, Hana Pa'a. 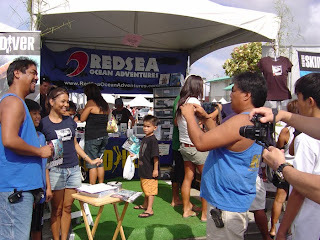 Owned by the Kaya ohana they have it all! Next April we are heading to New Zealand so I needed a 5-mil wetsuit and just so happen they got their new "flounder" suit that just so happen fit perfect. Thanks to Sterling I'll be able to represent the HSD Team behind the camera. Hopefully I won't blend in the reef to much where I loose my dive partners. My friend Bert Akuna called me up to surf a secret spot on the "west side". These guys have been traveling on our Red Sea Boat trips and now that is all they do. Surf around the island on boats. Eddie Sakoguchi, Dennis Tsutsumi, Jeff Mizuno and his son joined us on this adventure. The waves were like Indo! There were two boats out so we waited 5 minutes, then jumped in! I thought I was at Macaronies for a moment. What a day! Now gotta go wrap my wetsuit and put it under our Christmas Tree. 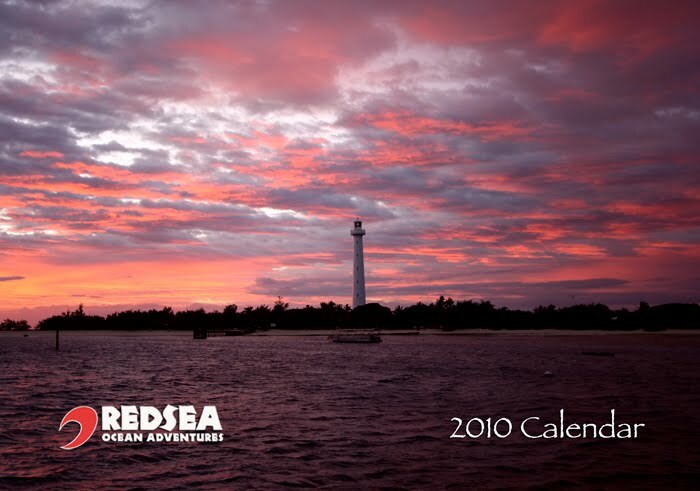 Have a Merry Christmas everyone and thank you for supporting Red Sea Ocean Adventures! May all your dreams come true! Today the winds were north so that meant go south! Kirby Fukunaga called me to test out his boat that was under repairs so off we went. Joining us was Ryo Kubota who was lucky enough to make the research expedition. We was doing some close up research in preparation for his doctorate in micro biology. Good thing he had his 3-prong in hand. ha ha! As we were able to get a few fish for dinner tonight. "Nitsuke" style is the call for tonight and some fresh sashimi for the week. Winds should be moderate for the next few days then light and variable for the second half of the week, just in time for Christmas. Shop now, surf/dive later! Across the bay you could see hundreds of people like it was the Aloha Stadium. Standing room only with only 4 surfers out at 7:00 am. I heard there were over 40 surfers by noon. The sets were inconsistent but there were a few big 18-20 ft sets that made the watchers ooh and ahhh...Conditions were not perfect so the "Eddie did not go". So I left and headed for my favorite bakery on the North Shore to pick up my favorite pastry. Drove to Makaha hoping for more rideable surf but it too was inconsistent but a few bombs did roll in. The traffic in Waianae is super slow with the road construction so better stay away. Tomorrow should be BIG and little cleaner than today so maybe "Eddie might go". Today was the day to dive! I haven't dove for at least a month with all these waves so when the window opened up I was there! Santa came early and delivered a nice load of uhus, goats, and other fish for dinner. Kirby and Erick was diving with me and after we dove..
Ittaaai! Classic kodak moment. Now Kirby can use his right hand to eat his fresh fish tonight. Surf's coming up so wax up "daniel-san". Last night my nephews were so excited as they saw their Christmas lights put up and even had rudolph the reindeer included. They had a sleepover and when the woke up they saw someone stole their reindeer and ripped off some of their Christmas lights. How's that? What kind of person would even consider doing such a horrible thing? Wow Thanksgiving is this week! And Christmas and 2010 is right around the corner. Well if you need a calendar to keep track of your days stay tuned for the 2010 Red Sea Calendar. Some sick shots of some of the most exotic places in the world with underwater, sunsets, diving & cultural images that will inspire you! It will be available beginning of December and will make the perfect Christmas gift! Contact me to see how you can get your copy! 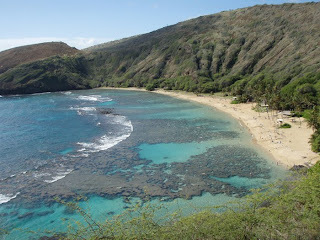 Today I had a early photo shoot at Hanauma bay. I haven't been here in years and it's no wonder why so many tourists come here for the spectacular views and friendly fish. If you are local then it's free but tourists pay over $7.00 to get in. I paddled outside the breakers with a $1 inflatable flourescent red mattress as the lifeguards thought I was either crazy or ready to be saved. There reef was sticking out where you see waves and no wonder the mattress did not pop as I charged over the reef. Then James aka "McGuyver" calls to go over and see the HGEA craft fair. Lot's of nick nacks and food items to buy. 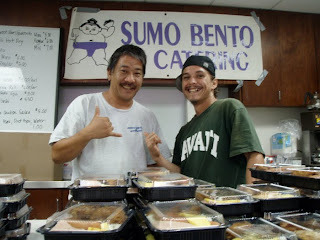 And I come across my friend Alan Watanabe from "SUMO BENTO" selling plate lunches. They have been doing this for years and was stoked to see him again. Thanks for the grinds! Weather should be clearing up in the next few days and winds backing down a little so get ready to go dive or surf. Lot's of fun surf been coming through our islands so not much diving at the moment. Today is small so good day to get on the computer and get some work done to start planning our next trip. Last year we got some great surf in Indonesia and I think we will need to revisit some of our secret spots real soon. Here's a shot Renee Vento captured at a fun right-hander with just four of us out. I can't wait to surf it again! Until then, I can only dream on! On our visit to Okinawa we got to see the Churaumi Aquarium. It was a long drive north but well worth it. Huge Uluas, Tunas, and even Whale sharks can be seen in the main tank. You need at least 2 hours to get to see all the exhibits and if you are lucky can even see the feeding of the Whale sharks. 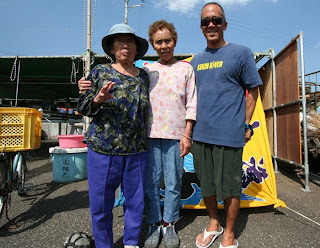 Okinawa is really a relaxed place and the people are so friendly. I can't wait to go back for another visit. Mensore! Our thoughts and prayers go out to all those in Samoa who has been devastated by the Tsunami/Earthquake yesterday. I was watching the news and just thinking about our last trip there where we got to meet and fellowship with the locals eating palusami (lau lau) and dancing the Samoan slap dance. 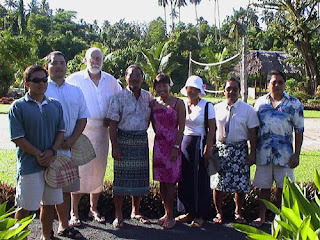 This was half of our group going to church on Sunday, while the other half were hung over from the night before drinking too much kava. If you ever wondered where that one opening shot on our program "Hawaii Skin Diver" with this beautiful pond...now you know! It's in Samoa. 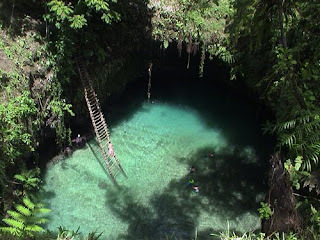 This huge ladder goes down into this aqua green colored pool/cave which opens up to the ocean on the other side. Amazing!